In the SATARA® OPTI biotin supplement, vitamins and essential fatty acids mingle to promote your strongest, healthiest hair yet. You get it. Beauty starts with good health — which is why you stock up on the trendiest super foods — but why biotin? We asked Dr. Peter Jenkin of Dermatology Associates of Seattle to break down the benefits of the nutrients in OPTI so we know exactly why this will be an integral part of our daily routine. 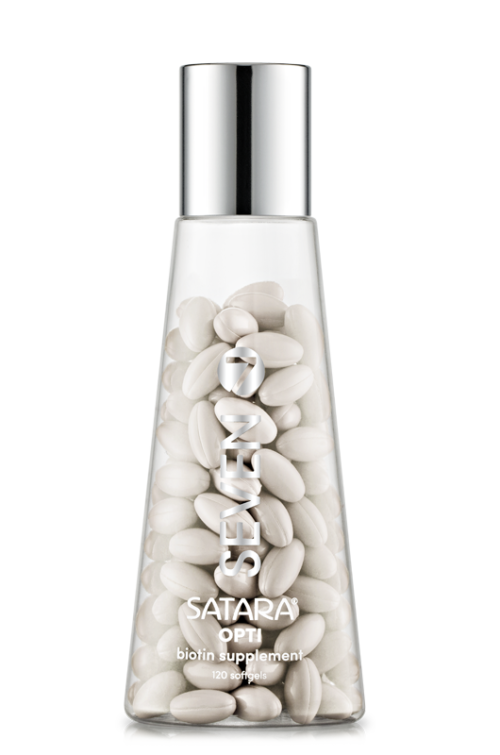 Our SATARA OPTI supplement contains several elements, but most importantly, a LOT of biotin. From your perspective, how can biotin help hair, skin and nails? DR. JENKIN: Biotin is one of the B complex vitamins (B7). As such, it plays an important role in cellular metabolism helping the body process energy and eliminate carbon dioxide. It is thought to play a role in forming protein such as keratin, which is the basic protein that makes up skin, hair and nails. It is well known that biotin deficiency causes hair loss and brittle nails. As a result, biotin supplementation has been widely used for hair loss and brittle nail conditions. Is there a simple way you can describe how biotin works? Dr. Jenkin: Very simply, biotin is a necessary part of the enzymes which break down fats and carbohydrates and gluconeogenesis (glucose formation). It is also important for the nervous system. What can we do to our scalp to ensure it’s healthy on the outside, while you’re promoting its health from the inside? Dr. Jenkin: To ensure a healthy scalp it is important to properly wash on a regular basis. (Editor’s Note: We recommend VOLUME shampoo, a lightweight, deep cleansing daily shampoo.) This prevents the built up cellular debris around the base of the hair shafts which can allow for the buildup of more bacteria and yeast. It is also important to use a conditioner on the hair on a regular basis to counteract the damaging effects of brushing, blow drying and sun exposure. As one’s hair is thinning, it’s also important to wear a hat when outside to prevent sun damage on the scalp. The scalp is particularly prone to damage from acute and chronic sun exposure. Can people be allergic to biotin? Dr. Jenkin: Since biotin is a necessary component for life, you cannot be allergic to it. In an oral supplement however, it may be possible to have an allergy to some of the other ingredients in the tablet or capsule such as food dye. Stay tuned for part 2 when Dr. Jenkin breaks down the other essential nutrients in OPTI! In the meantime, to keep up with Dermatology Associates, please visit them on Facebook and Instagram.